This is a no-dog beach. Gulf Shores is a small resort city popular with tourists located on the Gulf of Mexico, southern Alabama. Its expansive beautiful beach is certainly one of the prettiest in the country and boasts sugar-white sand and clear emerald-blue water. Winters are mild and summers are hot here, which provides excellent beach weather most of the time. At that, the sea breeze is always extremely pleasant on the hottest and humid days. Just perfect! No wonder tourism plays an increasingly important role in the city economy and things like fishing, boating cruises, and beaches are the main attractions of this area. 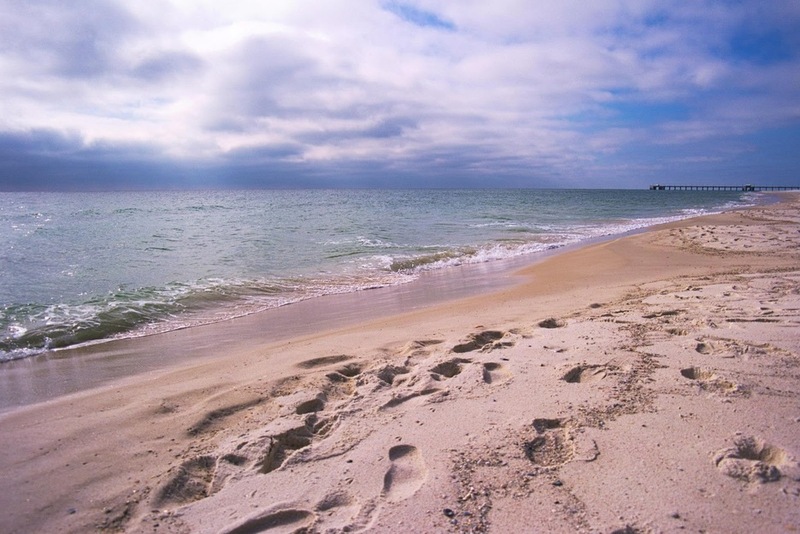 Gulf Shores Public Beach is easily accessible. 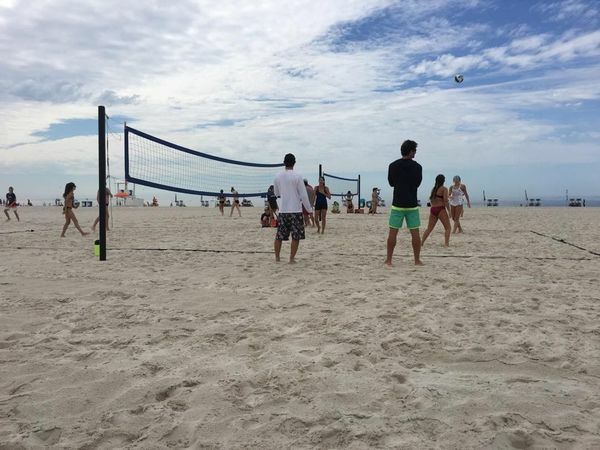 It stretches over several miles and there are many beach entrances with restrooms and varying parking lots where you have to pay a parking fee from March through November (the self-pay stations accept credit cards as well cash). Nevertheless, year-round free parking is always available within a short walking distance. The beach isn’t very much crowded but there are really busy days when you should arrive earlier to be able to quickly find a free spot for your car. Not only white dunes and emerald waters make this beach attractive to the eye but also its exceptional cleanliness. There is plenty of work done to make this place well-maintained and comfortable for numerous visitors at any time. The beach workers screen the sand and take out litter and driftwood. 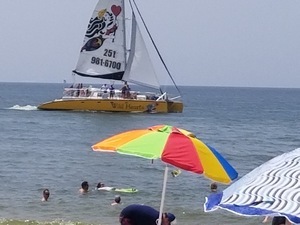 There are also lifeguards on duty and officials patrolling the beach. All the facilities – which include public restrooms, showers, and covered picnic areas – are kept well, too. You won’t see bunches of teenagers drinking beer and listening to loud music. Gulf Shores Public Beach has a very relaxing family atmosphere – a nice place to take your kids to. The best times for shelling are mornings after the storm. At other times, shells may be scarce but instead, you can entertain your children with toys from the exchange toy box on the beach – in case you forget your own toys at home. If you’re fond of picnics, you’ll be pleased to see several picnic tables and covered areas where you can still have a good time even in bad weather. There are also a few boardwalks, a well-designed promenade, and a pier. All the facilities and the areas are kept in perfect condition. If you want to relax with additional comfort, you can rent beach chairs with umbrellas on site. You will also be pleasantly surprised to discover that free Wi-Fi is provided as well. 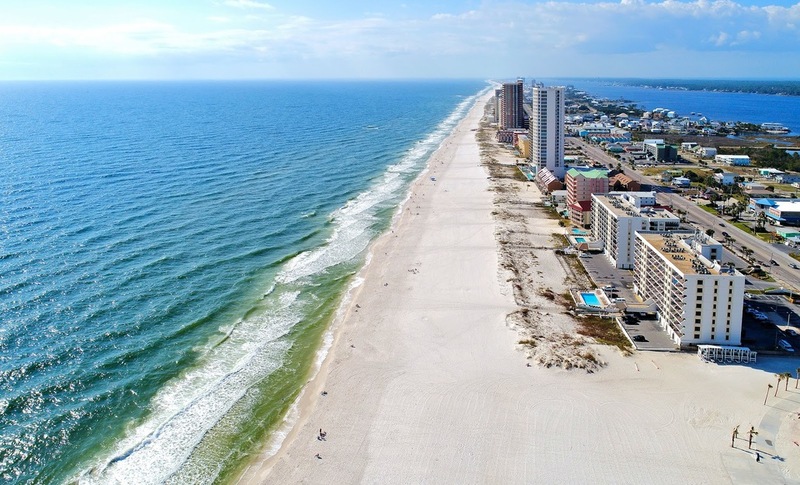 Since there are plenty of beaches in Texas where visitors are allowed to take their dogs on a leash, it should be pointed out that dogs are strictly prohibited under any circumstances on Gulf Shores Public Beach.